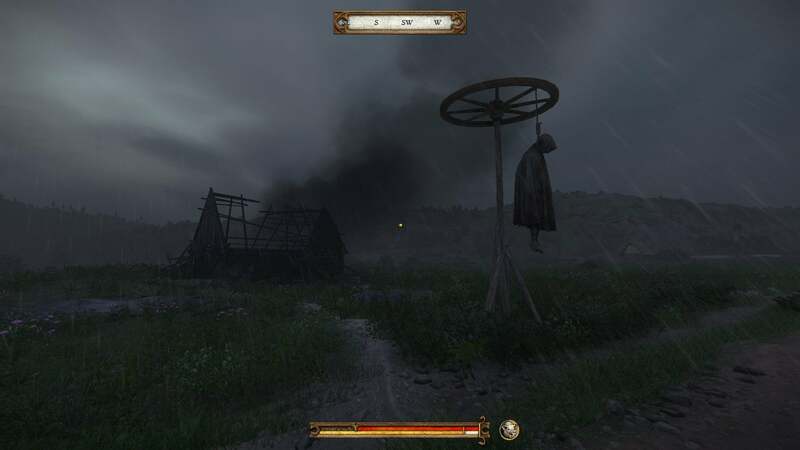 It was a triumphant moment when I finally bought a sword in Kingdom Come: Deliverance. Here I was, Henry the blacksmith’s son, one of the few survivors of the attack that burned my home village of Skalitz to the ground, a man with little money and even fewer prospects, assistant to a C-tier lord in the Holy Roman Empire—and I could finally afford my first sword. Not even a proper longsword, mind you, but something called a “hunting sword.” Still, I strapped it to my side with all the pride befitting a peasant who ever-so-slightly increased his social status in class-centric Medieval Europe. 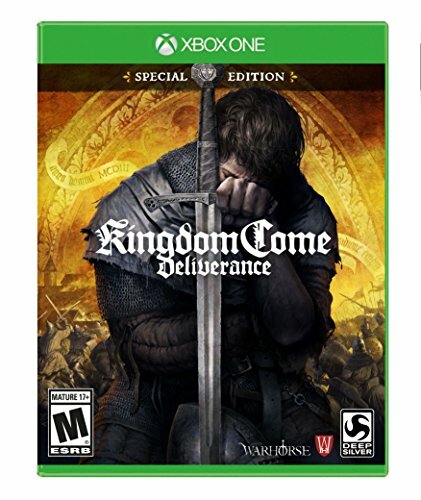 I bring it up because it’s indicative how different Kingdom Come: Deliverance ($60 on Steam) feels from other RPGs. There, you’re usually the chosen one, destined to save the world. Here, I’m over 20 hours in and I’m basically a glorified intern-in-armor. I spent a whole day carrying some spoiled noble’s equipment out to the woods so we could hunt rabbits. Since then, my biggest responsibility is solving the murder of some no-name peasants and their horses in a backwater village with only four or five homes. I also drank myself senseless with a priest, then delivered a sermon barefoot the next morning. You could say that was a low point for Henry. Probably. 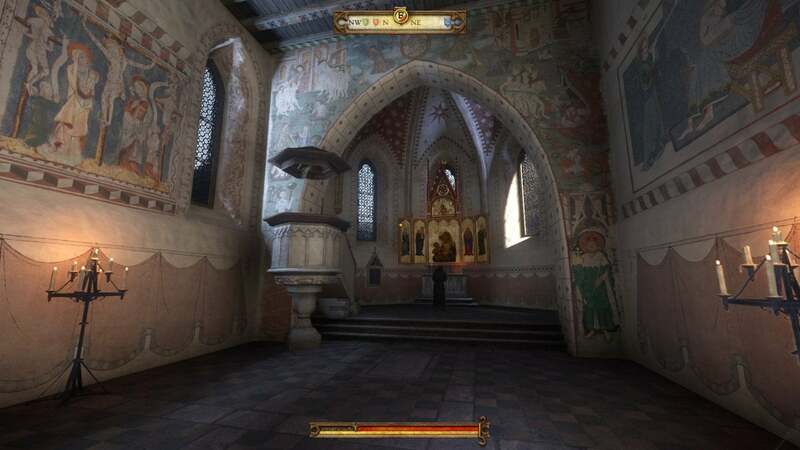 Kingdom Come: Deliverance is essentially an Elder Scrolls-style RPG made “realistic.” Abandoning the fantasy lands of most sword-and-board stories, Kingdom Come instead builds a tale around Bohemia, the region of modern-day Czech Republic and, as of the 1400s, the Kingdom within the Holy Roman Empire. A time when people said "arse" and meant it. There’s a succession crisis. After the glorious reign of Charles IV, his son Wenceslaus IV inherited the crown of Bohemia. Being rather more interested in drinking and gambling than ruling, he was considered a poor king, which prompted his brother Sigismund to invade to “restore order.” Sigismund’s motives weren’t quite so pure of course, and his troops cut a swathe through Bohemia, including through the town of Skalitz, a silver mining town and home to our poor protagonist Henry. This all happened. 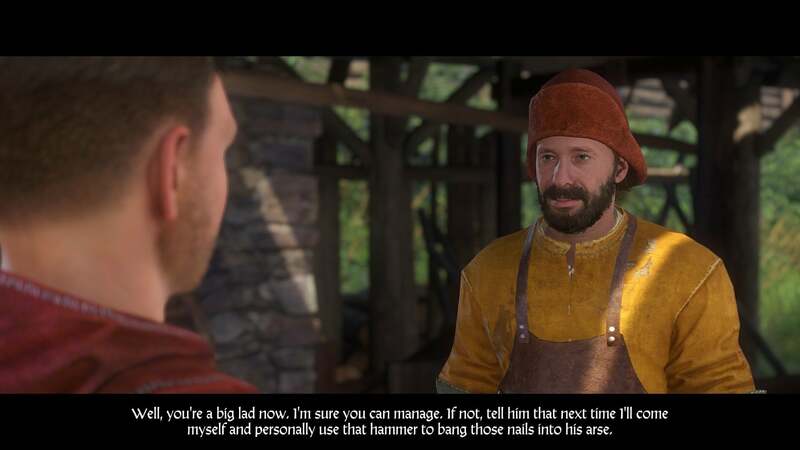 Well, maybe not Skalitz and maybe not Henry’s exact story. 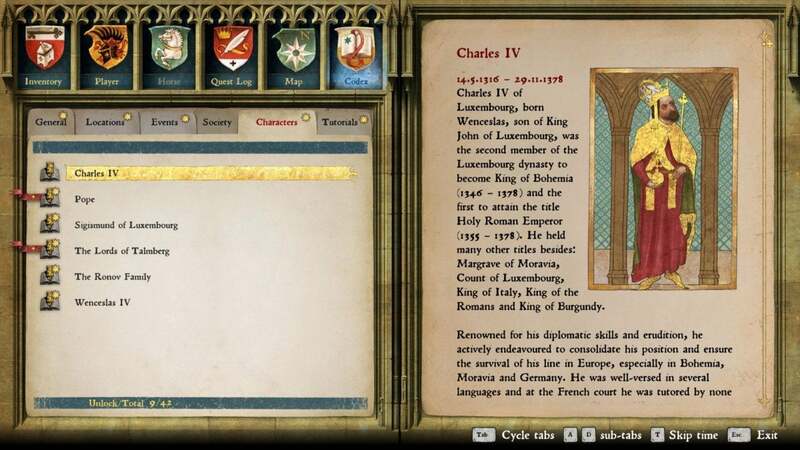 Kingdom Come is drawing on real history though. The Hussite Wars, the Protestant preaching of Jan Hus, the Papal Schism of 1378—all these events are common topics of discussion in Henry’s Bohemia, because he’s living through them. If I’m remembering correctly, Kingdom Come’s towns are even located where they would’ve been located in real life, and with layouts that match what few maps survived to the modern day. For history enthusiasts, Kingdom Come: Deliverance is a dream. Later, luck has you promoted to essentially the local militia, but even that’s a long way from the top. Your reward is a rusty helmet, a torn shirt, and a stick. A stick! They call it a bludgeon, but I spent hours basically defending myself with a rough-hewn piece of firewood while nobles spat at me and chastised me for trying to enforce the laws on them. It’s a fascinating game in that regard, a true “role-playing game” in the literal sense, not what the term’s colloquially come to represent. Hell, it almost feels like a simulator at times, especially given the number of systems layered on top. There are skills for basically every action in the game. Swords and speech and defense, sure, but also skills like “Drinking” and “Horsemanship.” There’s even a “Reading” skill, and until Henry’s learned to read properly every book he finds is written in anagrams. You’ll have to eat on a schedule, sleep on a schedule. If you don’t bathe, your charisma goes down, and you’re worse at stealth too. Stealth is also affected by your clothing. Heavier clothing makes you clumsier, but it’s more complex than that. The materials matter too, with metal clanking on every step—unless, of course, you repair your armor yourself in which case you can pad the metal to make it more stealthy. Colors also contribute, with black blending in at night but making you more conspicuous during the day. The maps are gorgeous, too. And then there’s combat. It’s not amazing. Actually, it feels downright bad at first. Slow, clunky, and awkward, alternating with moments where it falls into the “Two people swinging pool noodles” airiness of most first-person swordfighting. Chaotic largescale battles are a nightmare, with the lock-on trying to attach to a dozen different people at once. You sort of learn to live with it though, and I did feel like Henry improved noticeably over time—which probably makes sense for a blacksmith's kid with zero combat experience at the start. There's also a surprising amount of depth, with Kingdom Come folding in six different stances, plus combos, feints, parrying, and more. Best of all: Helmets properly occlude your vision. You’re welcome to wear full plate armor (if you can afford it), but when you do your vision is limited to a thin band of light in the middle of the screen. It’s cool. It’s complicated. 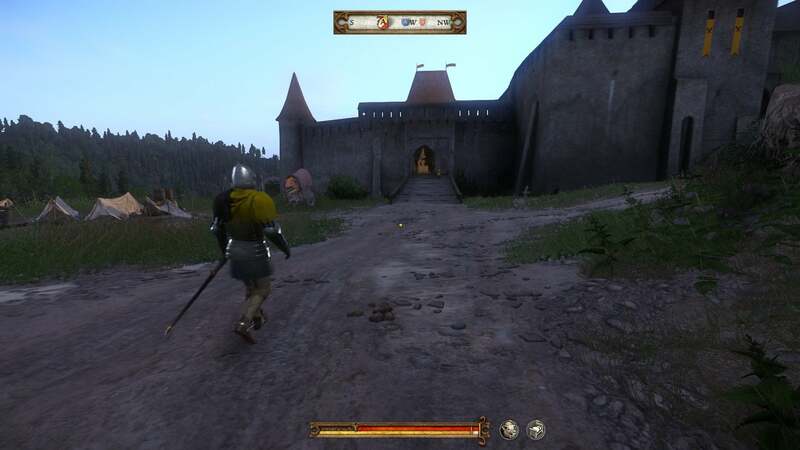 In many ways, Kingdom Come feels like the principles behind Deus Ex or Thief or System Shock, the so-called “immersive sims,” but writ large on an Elder Scrolls-style game. It’s ambitious to be sure, and sometimes too much so. I’m excited by Kingdom Come but it’s also, as with so many genre-breaking games, an incredibly flawed experience at times. I’m often annoyed, or simply bewildered. Sometimes both. The save system is chief among my complaints. Kingdom Come autosaves from time to time, usually after major quest updates. The only way to save outside those moments is to carry an alcoholic drink called “Saviour Schnapps,” represented as a floppy disk inside a flask. It’s cute, and prevents you from abusing the save system at every turn like you might in an Elder Scrolls game. The problem: Autosaves are few and far between, and Saviour Schnapps prohibitively expensive in the early game. We’re talking 100 gold in a game where the average quest reward is 5 to 25 gold, and where it took me 10 hours to even afford repairs on my equipment. After 20 hours, I’ve just barely earned 1,500 gold total. I understand wanting to make the item precious instead of me hitting F5 to quicksave every two minutes, but I think the pendulum’s swung too far the other direction. More annoying is the game doesn’t actually let you save even if you want to exit the game. If you don’t have Saviour Schnapps? Too bad. You either find an autosave before leaving or you lose all progress since the last one. That’s some straight-out-of-2003 design, and I’ve had nights where it took me upwards of half an hour before I could safely exit. 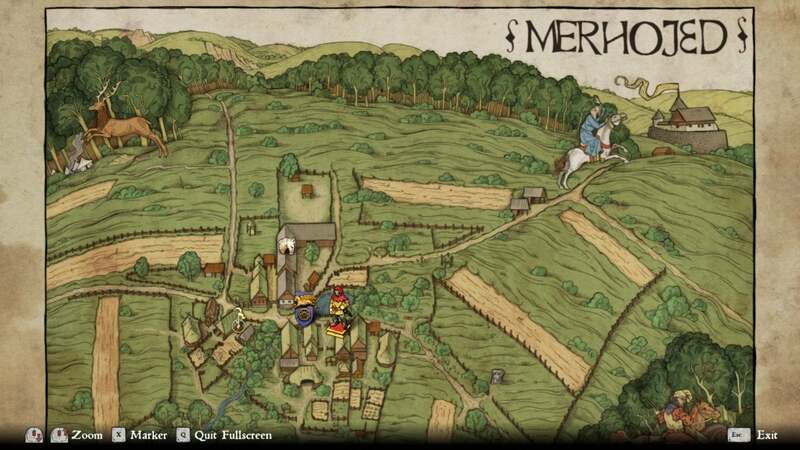 Kingdom Come is also riddled with bugs, which is to be expected in an Elder Scrolls-style game I guess, but it's nevertheless annoying, especially when quicksave can’t help me. I’ve gotten stuck in the geometry, had quest scripting go haywire, tried to jump over a bush and found myself thrown 30 feet through the air, watched my horse get stuck in a cliff, had conversations with the side of someone's face, and so on. Basically the horse from Oblivion. None of this dampened my spirits much, and luckily the more egregious problems have surfaced for me soon after an autosave, but the game’s definitely janky. The AI also fluctuates between “Solid” and “Stupid,” with the oddly-stilted schedules I associate with Bethesda’s “Radiant AI” circa Elder Scrolls IV: Oblivion. Characters and background villagers are just uncanny at times, entering rooms and then leaving for no reason or lining up to wait for you to trigger the next quest step. We also haven’t solved the problem of “Two people trying to pass each other in a narrow space,” with Kingdom Come making you batter into people until they move out of the way. But it’s the load times that are most egregious. Start-up time is a bit slow, clocking in at around a minute before you get into the game, but that one’s not too surprising at least. Worse is the fact that every conversation is preceded by a load screen. Sometimes it’s a quick two-second black screen. Other times, especially with cutscenes, the action is interrupted for upwards of 15-20 seconds. The worst instances are when Kingdom Come transitions from dialogue to pre-rendered cutscene and back to dialogue—that can mean three separate load screens for a short conversation. Again, this isn’t an insurmountable issue. I’ve learned to live with it, so to speak. But it can be disorienting to start a conversation with some unimportant villager and be kicked to black for a few seconds before the generic “Blessings be upon you” greeting or whatever. It’s made me less interested in talking to anyone who’s not of immediate interest. Kingdom Come looks and runs better than it has any right to, given the size of the world and the relatively small size of the team that worked on it. CryEngine is great for creating realistic outdoors environments, and it’s stunning what developer Warhorse has done with it here. Whenever I hit one of those long load times though, or the frame rate starts stuttering when lots of people show up, I’m left thinking “CryEngine was not built for enormous RPGs like this” and wondering if that’s the heart of the issue. I hope I’m wrong and that some of the rough edges can be sanded down post-launch, but it's safe to say the rough edges desperately need sanding. Jank aside, I think it’s a pretty incredible undertaking though. Kingdom Come’s flaws arise from its depth, from ambition, from its unique aesthetic and ideas, and I’d rather deal with its problems than play an ultra-polished experience that simply retreads old ground. It’s reminiscent of The Witcher in that respect—the early games, before The Witcher 3 became accessible enough to go mainstream. Maybe the next Kingdom Come will be more approachable. 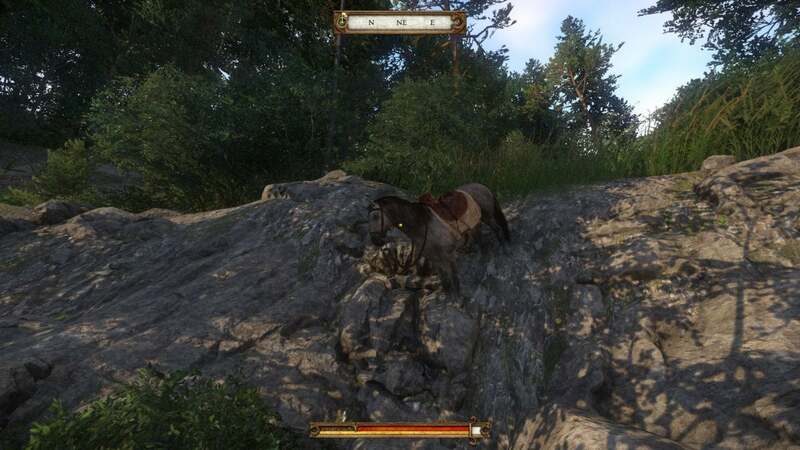 For now, Kingdom Come: Deliverance is decidedly niche, and all the better for it. I’m not sure how long it will take me to get through the rest, nor how high Henry can rise through the ranks. Knight? Lord? Only time will tell I guess. I’m looking forward to finding out, in any case. And looking forward to learning to read one of these days too.